ST. GEORGE — The intersection of River Road and Riverside Drive has had its share of wrecks lately. Monday afternoon saw the latest installment as two cars waiting to turn left smacked each other. The signal turned green for the Chevy driver, so she started through the intersection. The Mercedes driver, thinking he had the right of way, turned left in front of the Chevy and the two cars crashed in the middle of the intersection. 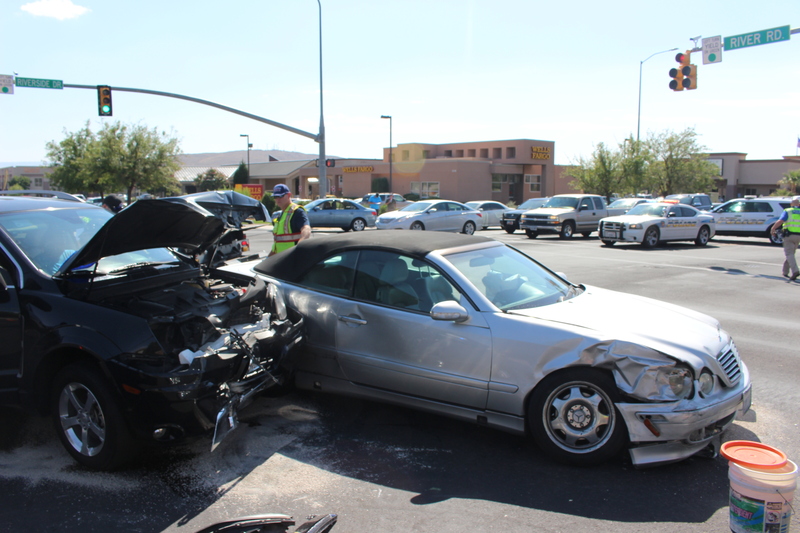 Both drivers were transported to Dixie Regional Medical Center in St. George to be treated for their injuries. The Mercedes driver was taken by ambulance and the Chevy driver by private vehicle. Both vehicles had to be towed from the intersection. Hale said the driver of the Mercedes would be issued a citation for failure to yield on a left turn.